O Lord, which for our sake didst fast forty days and forty nights: Give us grace to use such abstinence, that our flesh being subdued to the spirit, we may ever obey thy godly motions, in righteousness and true holiness, to thy honor and glory, which livest and reignest, etc. We as helpers exhort you, that ye receive not the grace of God in vain. For he saith, I have heard thee in a time accepted, and in the day of salvation have I succored thee. Behold, now is that accepted time; behold, now is that day of salvation. Let us give none occasion of evil, that in our office be found no fault; but in all things let us behave ourselves as the ministers of God, in much patience, in afflictions, in necessities, in anguishes, in stripes, in prisonments, in strifes, in labors, in watchings, in fastings, in pureness, in knowledge, in long-suffering, in kindness, in the Holy Ghost, in love unfained, in the word of truth, in the power of God; by the armor of righteousness of the right hand and of the left, by honor and dishonor, by evil report and good report; as deceivers and yet true, as unknown, and yet known, as dying, and behold we live, as chastened, and not killed, as sorrowing, and yet always merry, as poor, and yet make many rich, as having nothing, and yet possessing all things. 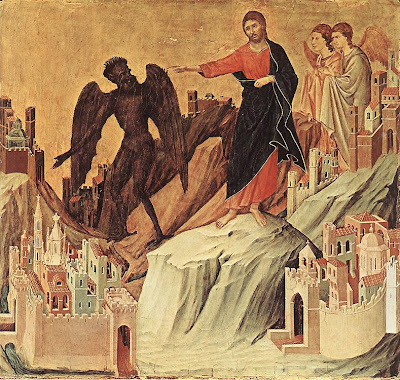 Then was Jesus led away of the spirit into wilderness, to be tempted of the devil. And when he had fasted forty days and forty nights, he was at the last anhungered. And when the tempter came to him, he said, If thou be the Son of God, command that these stones be made bread. But he answered and said, It is written, man shall not live by bread only, but by every word that proceedeth out of the mouth of God. Then the devil taketh him up into the holy city, and setteth him on a pinnacle of the temple, and said unto him, If thou be the Son of God, cast thyself down headlong. For it is written, he shall give his angels charge over thee, and with their hands they shall hold thee up, lest at any time thou dash thy foot against a stone. And Jesus said unto him: It is written again, Thou shalt not tempt the Lord thy God. Again the devil taketh him up into an exceeding high mountain, and showed him all the kingdoms of the world, and the glory of them, and saith unto him: All these will I give thee, if you wilt fall down and worship me. Then saith Jesus unto him, Avoid, Satan, for it is written, Thou shalt worship the Lord thy God, and him only shalt thou serve. Then the devil leaveth him, and behold, angels came and ministered unto him.